The first of many karate fighters. A single player competes against a computer opponent using two joysticks to perform a variety of moves. The best two matches, out of three, wins. There are twelve different tournaments with twelve different scenaries that you have to win in order to become the champion. During each tournament, you must demolish your opponent with a single blow while dodging or blocking your opponent’s attacks. You must win two rounds in the tournament in order to proceed to the next. You need to score from 600 points to 1000 points when you strike your opponent in order to gain a full point in the round. If you only score 100 points to 500 points when you strike your opponent, you will only get a half point in the round. You need at least two full points in each round, in order to win the tournament. If time runs out during the round, your score will have be higher than your opponent’s or you will have to be the one who scored before time runs out, in order to win the round. 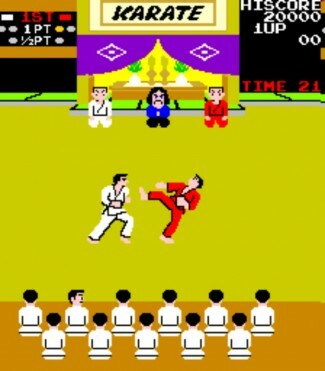 Between each tournament, there is a bonus stage that will require you to either evade flying objects and then destroy them with your hands or feet, a “Demo” where you will attempt to split all the wooden boards with one kick or try to knock out up to three separate charging bulls with a single punch or kick.